"After gaining momentum on Election Day 2018, our fight to shift the balance of power away from Republicans before redistricting occurs in 2021 continues," the NDRC's website says. "During the 2019-2020 election cycle, the NDRC is targeting 12 states, including 3 gubernatorial races, 13 state legislative chambers, and one down-ballot race." The NDRC did not respond to a request for comment on its upcoming efforts and if the target list was influenced by the possibility of Holder running for president. 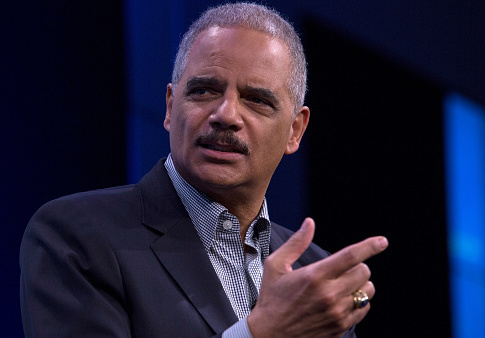 Holder has previously expressed interest in running for president and is making his way to Iowa in February, the Des Moines Register reports. Holder will deliver a speech at Drake University's Harkin Institute for Public Policy & Civic Engagement, which has fueled more speculation that he will be running in the Democratic primary for 2020. The NDRC is backed by President Barack Obama, who before leaving the White House held a strategy meeting with Sen. Chuck Schumer (D., N.Y), Rep. Nancy Pelosi (D., Calif.), and former Virginia Governor Terry McAuliffe—also now a potential 2020 candidate—where they identified breaking up Republican controlled areas as a top priority for Democrats. Holder said the group's mission is personal to Obama who resented Republicans for impairing his goals after taking over the House of Representatives. "The tasks that he had placed before him were made a lot more difficult, progress a lot more difficult, than it needed to be," Holder told the New York Times in early 2017. "That's because of the Congress that he had to deal with, which was a function of the 2010 redistricting effort." Marc Elias, a top Democratic lawyer at the D.C. office of the Perkins Coie law firm, and who served as Hillary Clinton's top campaign lawyer, is the NDRC's senior adviser and general counsel. Kelly Ward, the former executive director of the Democratic Congressional Campaign Committee, is the NDRC's executive director. The NRDC's board of directors includes Ali Lapp, the president of the Pelosi-linked House Majority PAC; Elisabeth Pearson, the executive director of the Democratic Governors Association; Jessica Post, the executive director of the Democratic Legislative Campaign Committee; and Greg Speed, the president of America Votes Action Fund. This entry was posted in Politics and tagged 2020 Election, Eric Holder. Bookmark the permalink.